WHAT DO PINE CONES HAVE TO DO WITH LAPIDARY? Be sure to read to the end, where there's a great Lapidary poem sent to me by reader Edward Clay! Pinolith,(or as Mindat calls it Pinolite) is found only in Austria (and selected rock and mineral shows.😏. It is named for the shapes of the markings which resemble the seeds that fall out of pine cones. The dealer was from Austria and had mined the stone. He called it Pinolith, so that's good enough for me. I found mine at the Tucson show. One huge bin of off-white rock with grey markings like long ovals caught my eye. Chemically, it's a mixture of dolomite, graphite, and magnesite. A big chunk of it not only caught my eye, it followed me home. One of the things that originally attracted me to it was the resemblance to Chinese Chrysanthemum rocks. This is my chunk of Chinese Chrysanthemum Stone. It's not a very good quality specimen--which is how it made it into the garden. In fact, it's almost like a Chinese Writing Rock (see below). Actually, from a mineral standpoint, they are nothing like Pinolith since thiis rock is dark limestone with light celestine crystals. The Writing Rock here is more like the Chrysanthemum stone than Pinolith, even though the markings are similar, since it is limestone, but this time with markings made of Andalusite. I'd seen some Pinolith shaped and polished so I knew it would make shiny cabochon. I'm guessing that after seeing so much at Tucson '16 it's probably spread around to quite a few other shows/sales by now. I hope so. It's great to work with. To me, it was a lot like working a good jasper. It takes a beautiful shine. If you like what you see here, please go to the top of the right side column and subscribe. You'll get my blog automatically delivered to you every two weeks and your contact information will never be shared or sold. When I first found this slab, my first impression was that it had measles—all those little red spots! But measles aren’t really much of a cabochon theme. It sat on my workbench for a long while; somehow it never got shoved back behind other projects, it just sat there. Then it started singing. No whispering for this slab, it loved to sing, and it’s song was I Feel Pretty from West Side Story (hear it at https://www.youtube.com/watch?v=L7BQRGXFLJshttps://www.youtube.com/watch?v=L7BQRGXFLJs). You know what an ear worm is? It’s when a song gets stuck in your head like a broken record and won’t go away. Every time I went into the shop, this rock started belting out this Broadway tune and that darned ear worm was dancing along. The slab wasn’t thick enough to make a large cabochon, so I settled on a smallish oval I decided to try to make it look like a Victorian garden, so maybe it would be demure and quiet once I was done. Okay, now it was pretty, but it wasn't happy. You can see that along with the orbs, it has varying background colors. I thought the orbs over the white area looked a bit like Trix in milk; not exactly an image that made me think of Broadway. Singing my heart out; ready for my Broadway debut! So, I tried again. This time I picked a more-or-less tear-drop shape. I also found a spot were the white was more aggressive. Now it was singing! I got lucky in the white ribbon trip around some of the most interesting bits. Only part of the ribbon showed when I started, but in the work to create the rounded top shape, it came to full glory and he darker, quieter orbs slipped into the background. I say I got lucky with this, because I've found I'm at least as likely to grind away a bit that I liked as to expose one. If you want to compare, this cab was made from the lower right portion of the rock at the top of this page. The white has changed shape somewhat, but there's still a single orb in the center of it. I think I'll mount this on a beavertail bail so I don't have to make a hole near the top that would be distracting. I'd love to hear about your experiences with orbs in cabochons. Drop me a note at Donna@LapidaryWhisperer.com and let's share! After the last posting on Druzy, Vugs and Lost Opportunities, reader, Jim Pecora, sent in an image of a cabochon he'd made with a druzy specimen. He mentioned that he had it wire wrapped in silver by Jewelry Hall of Fame member Jim Fowler of New Hampshire. Next Time: WHAT DO PINE CONES HAVE TO DO WITH LAPIDARY? Have you ever seen a slab that made you want to find the person who cut it and use power tools on them? (Rhetorical question, of course). My pet peeve is that when I’m at a show where vendors are selling slabs, they’ll often have a plastic bin of slabs from the same rock. Good so far. Then I look at the slabs and see where they have cut through a vug and then left the beautiful, druzy-lined opening too close to the edge to incorporate it into a cab or cut across it like it was waste. I know I’m not alone with loving those cozy druzy-lined holes in slabs. In fact, some jewelry makers cut small geodes cross-wise and use them as pendants for necklaces. Again, good. Lots of people get to enjoy one geode that way. And, sometimes I find a delightful story stone, but the story has been lopped off with a cut crossing a critical story element like a dramatic line or flower. Arrgggh. Since attacking a vendor for badly cutting their stones is considered anywhere from assault to attempted murder, that leaves us as lapidaries to come up with a new way to work with the slab—or not. 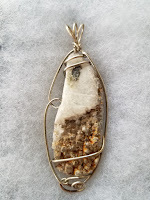 I admit if I see a story stone, whether it’s agate, jasper, or other minerals, and it looks as if it had its story amputated by a blindfolded cutter, I usually put it back in the bin and walk away. The few times I haven’t, I’ve gotten home to my shop and the slab never wants to talk to me. It just sits there, looking at me in defeat. These rarely get used. Tip! If you, like me, tend to carry a sturdy bag when I’m shopping for slabs, carry one or more of your lapidary templates in the bag so you can use the shapes to help develop design ideas when you’re looking at slabs. However, with slices with partial vugs lined with druzy, I can sometimes come up with ideas to focus all the positive attention on what I’d originally seen as a problem. For example, in the cab above, I would loved to have seen the full slab. But the part I found had a pattern of rounded bands that mirrored the curve of the vug. It told me it was really a basket filled with diamonds. So, that’s how I finished it! If you like what you see here, please go to the top of the right side column and subscribe. You'll get my blog automatically delivered to you every two weeks! Next time: I Feel Pretty!